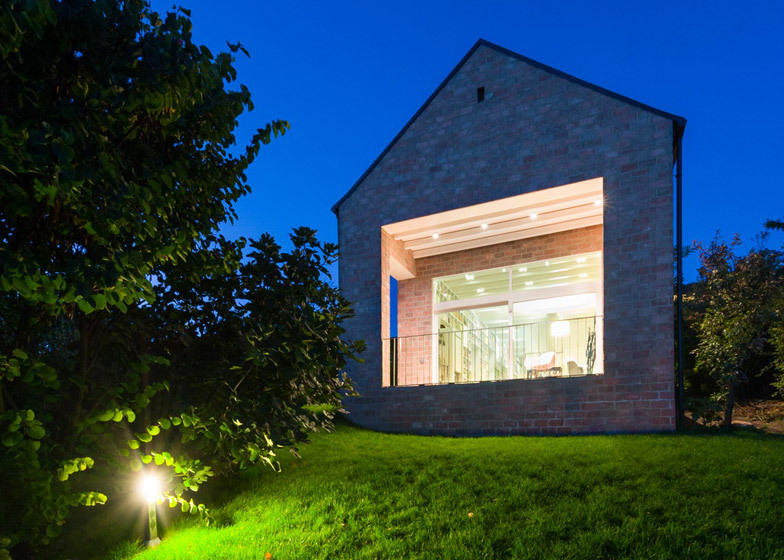 This long and narrow brick house outside Budapest, by Foldes Architects, integrates a 17-metre-long library wall that accommodates the owners' expansive book collection (+ slideshow). 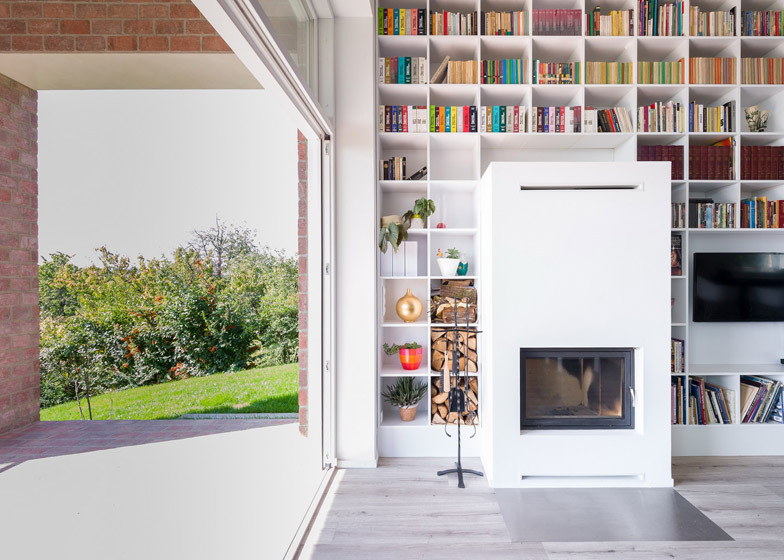 Long Brick House was designed by Budapest studio Foldes Architects for a couple who are retiring and requested enough space to display as many of their books as possible. "He is the rector of a university, and she was HR manager in a big planning office, and together they own a book collection close to 100 metres long," explained architect Laszlo Foldes, whose past projects include a volcano museum with dark concrete walls. 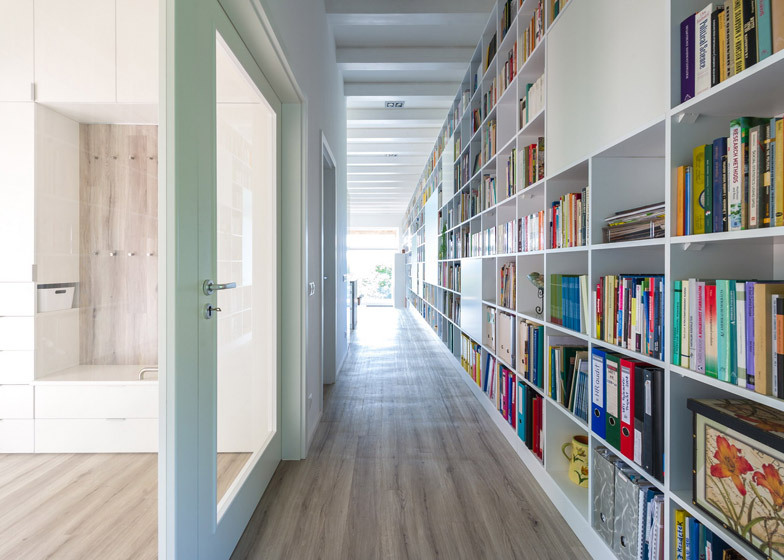 "To avoid creating under-used space, we maximised the potential of the corridor, turning the horizontal axis into a 17 metre-long library wall," he told Dezeen. 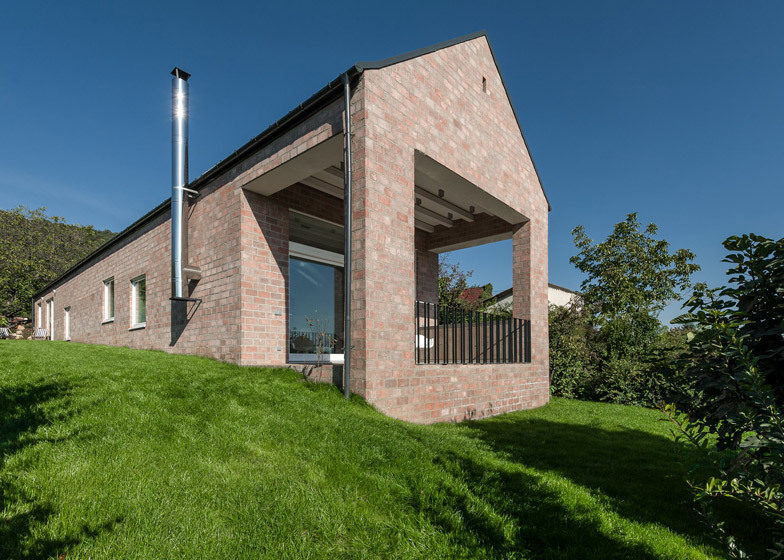 The one-storey brick house is built on a hill 15 kilometres from Budapest. It is concealed by trees that already existed on the site, which the owners wanted to keep. "When arriving at the gate, just the green canopy of trees and a minimalist parking lot are visible. 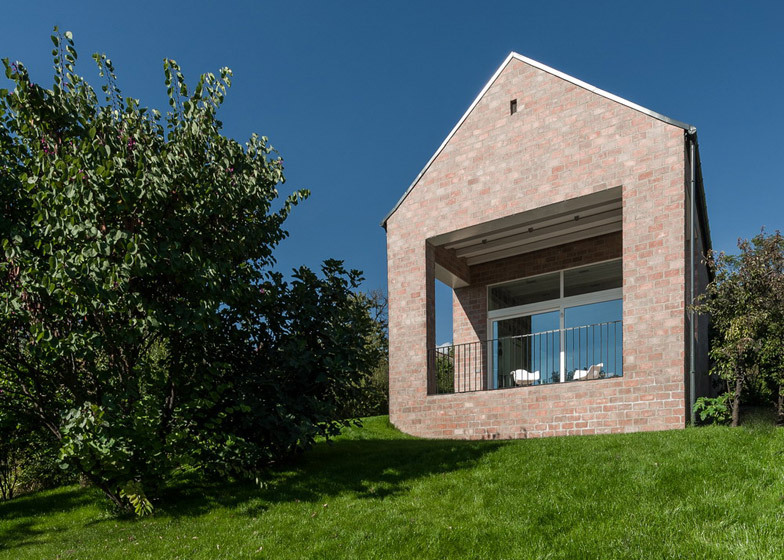 Thanks to the sloping garden, the house is hidden behind this rich setting," said Foldes. Inside, the floor follows the slope of the hill with a series of steps, so that rooms get progressively taller towards the back. 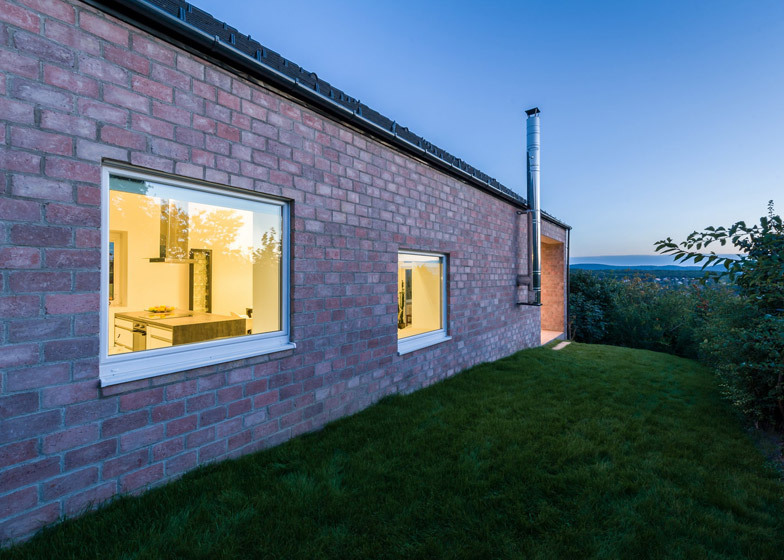 It culminates with a terrace overlooking a valley, which shades the house from the sun and offers a external space to shelter from the rain. 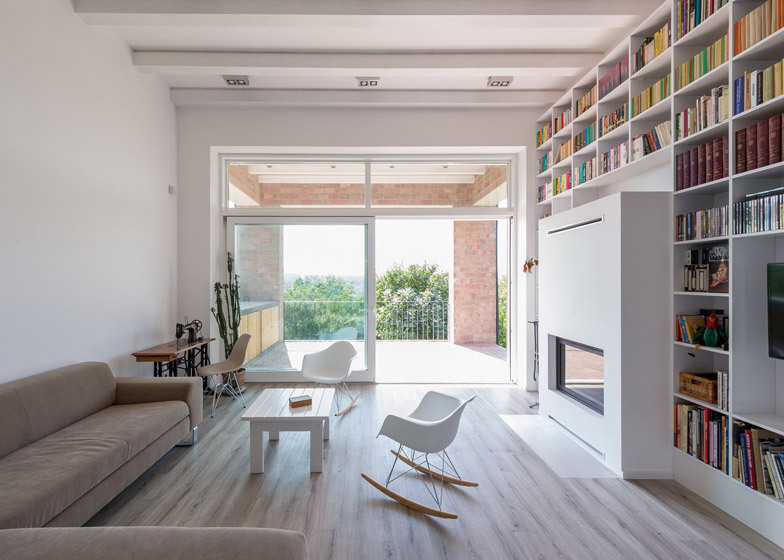 "The series of steps inside results in a variety of spaces, each enjoying higher ceilings and wider rooms, ending up with the limitless panorama of the terrace," said Foldes. 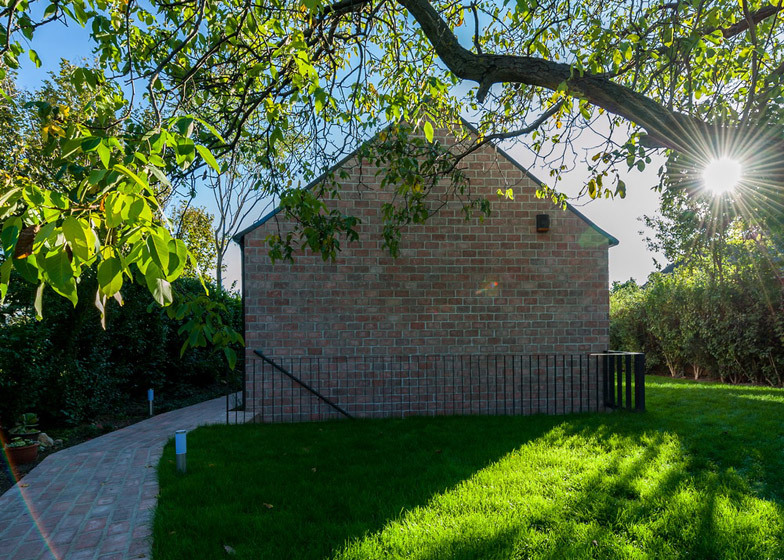 Private spaces have been grouped at the front, including a master bedroom suite and a guest bedroom that doubles as a study, while the open-plan kitchen, dining room and living room are located at the back. A corridor at the side connects these rooms and accommodates the 17 metre-long bookshelf, which is interspersed with three cupboards to conceal drinks and glasses, towels, and bills and letters. 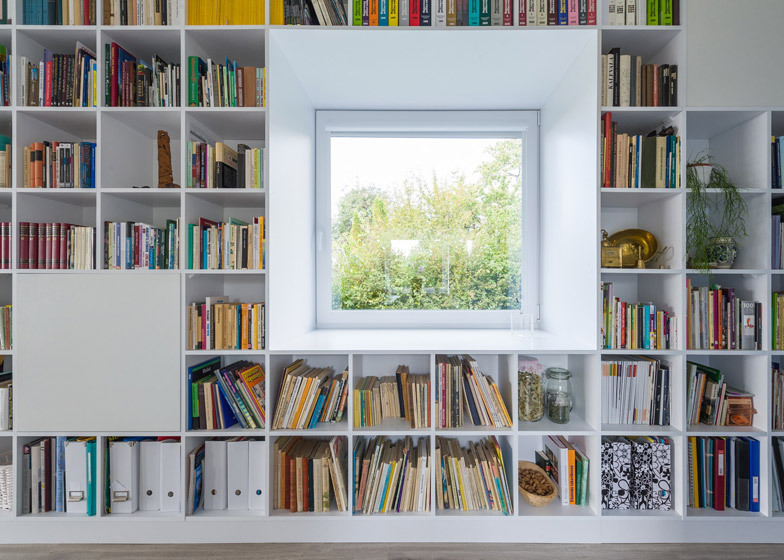 The 30-centimetre thickness of the bookshelf, combined with the 50-centimetre thickness of the wall behind it, also allowed the architects to incorporate three window seats into the structure, offering a view out to the garden that runs alongside. 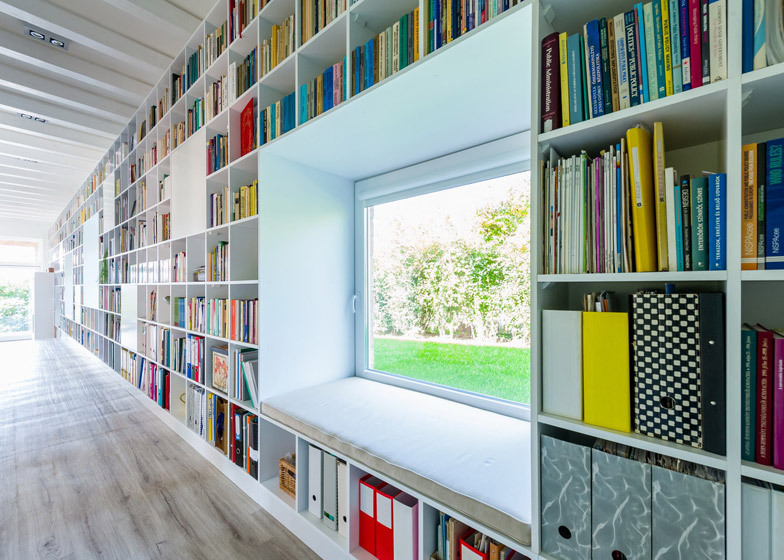 "The three window seats are very important – they bring life into the bookshelf," said Foldes. "Without these elements, the structure would be too monotonous." 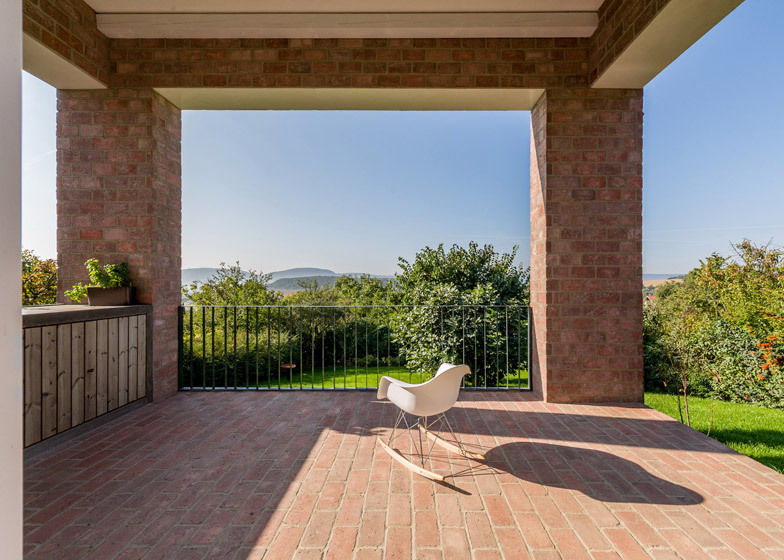 A west-facing terrace beside the master bedroom also provides a connection with the garden, so that the owners can enjoy sunset views over nearby hills. "Even though the mass of the building is longitudinal and disciplined, it has visual and spatial connections to the east and west sides of the plot too," said Foldes. 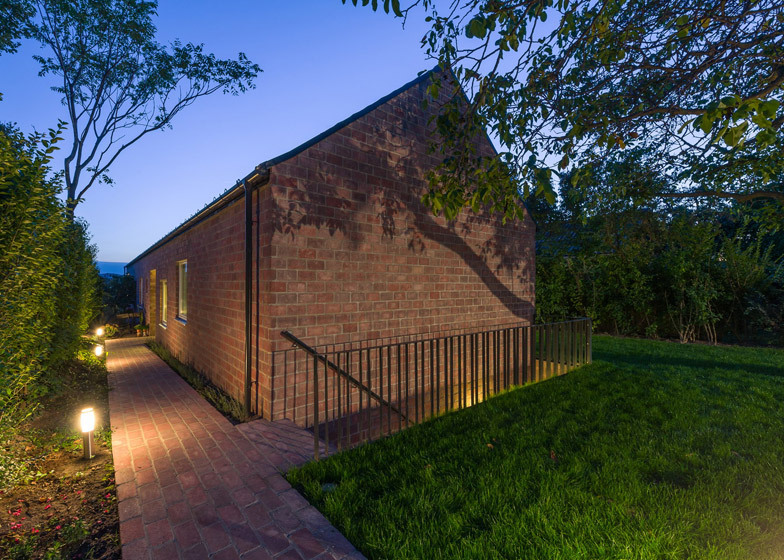 The front of the house also accommodates a small basement with a sauna and storage space, which is reached by external stairs. "We wanted to save square metres inside, so we created outside stairs to access this space," said Foldes. "If you use a sauna, it is good to go outside. In Finland they do the same." 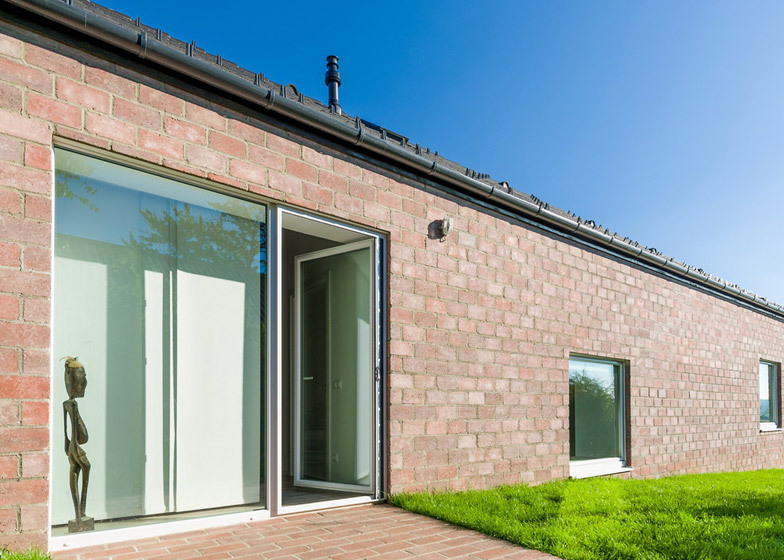 The house was built on a tight budget of €115,000, so wood-effect PVC flooring and PVC windows were chosen to minimise costs. "The shape of the building is also very simple, and the wood ceiling is part of the roof structure, which was economical," said Foldes. "The builders also had to compete for the job, and the best offer won." 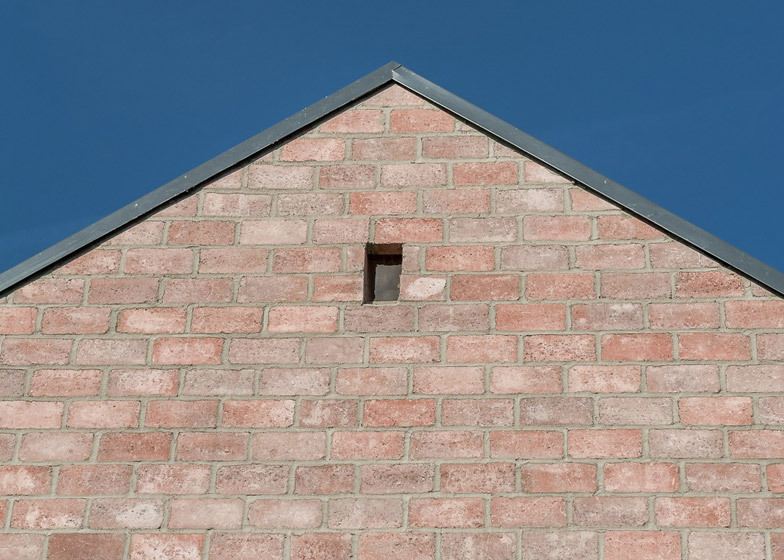 A well-ventilated attic has been designed to provide a thermal buffer zone, helping keep the house cool in summer and warm in winter. 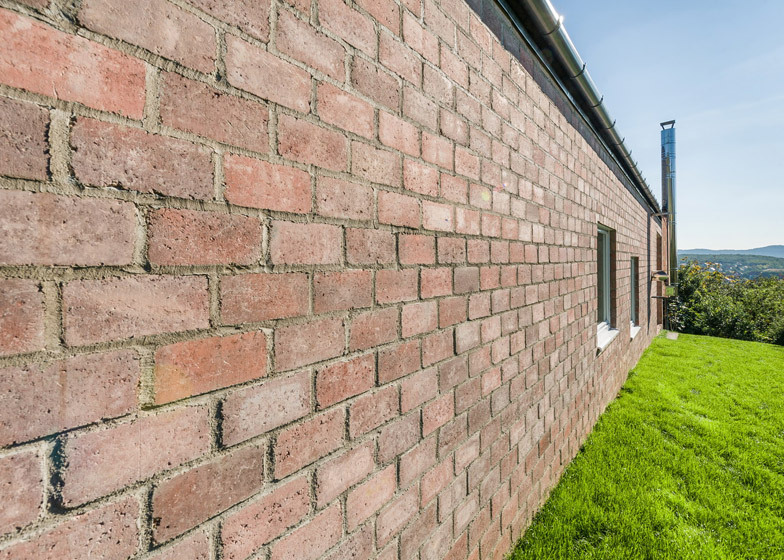 The 50-centimetre-thick sidewall, made of ceramic blocks with an external layer of bricks, also helps to modulate the temperature inside. "The thick wall is important because summers are hot. The mass of the building resists the heat, so it has a good natural climate inside," added the architect. "This way we didn't need to have air conditioning." A fireplace has also been incorporated into the library wall to heat the house in winter. "It was our general aim to assure the proper inner climate with architectural means rather than constructing huge machinery," said Foldes. Photography is by Levente Sirokai.